I know it's bit late to post this bear out, but I am really love him! 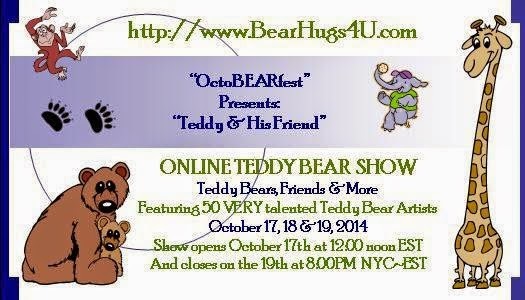 He is cutest bear that I have ever made! 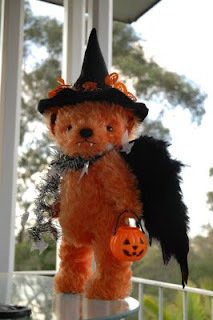 He is also my first ever Halloween bear, he is about 38cm height without hat (50cm height includes hat). As I want him can free stand, due to the huge wings. I add a lot of garnet powder in his both legs, so he is very heavy... about 1 kg! He has huge black feather wings, black felt witch hat with pumkin Halloween decoration. As Halloween in USA is about Autumn, so I gave him a scarf. Black & White scarf with ghost pieces around! 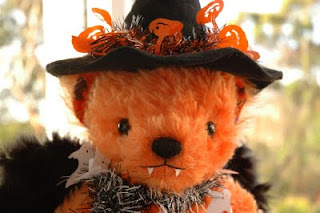 He is also carrying a pumkin candy basket, and he is ready for Trick or Treat!